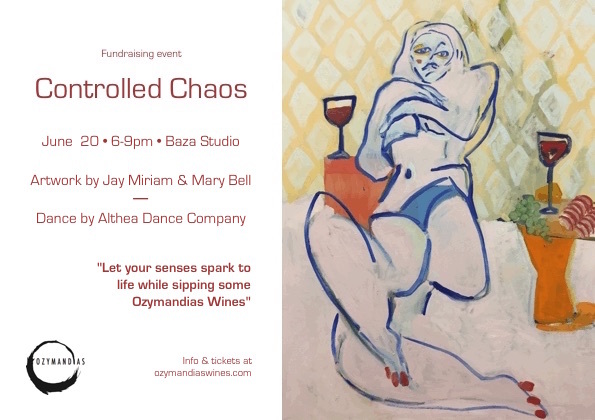 An evening filled with fine wine, delicious food, thought-provoking art, contemporary dance, and live music; all to raise money for art scholarships from Ozymandias Wines. Ozymandias Wines will pour complimentary white and red wines from the last two release years. You'll also have the chance to pre-order the 2018 red and white blend releases for special pricing while at the event. Inspired artwork by Mary Ball and Jay Miriam (respectively) will be displayed throughout the venue and will be available for purchase during the event. Ball and Miriam are Ozymandias Wines Scholarship recipients (Ball in 2017 and Miriam in 2018) for their uniquely talented work while attending the New York Academy of Art. Dance performances by Thea Bautista, Sarah LeGuenno, and Logan Pedon of Althea Dance Company will make the artwork come to life with specially choreographed pieces through their blend of contemporary flow and seamless movement. Fine cheeses, fruits, and other complimentary hors-d'oeuvres will be served to cleanse your palate and satiate your appetite between performances. 100% of proceeds will go towards Ozymandias Wines art scholarships.